For many, the decision taken by the government at the end of March to stop extracting natural gas at Groningen was monumental. After years of damage-causing earthquakes, the government said it was no longer socially responsible to keep drilling in the area. Though the decision came sooner and was stated more firmly than was generally expected, it plays into the government’s long-standing aim to stop producing natural gas by 2030. This is a precursor to the firm commitment made in the Paris Climate Agreement to make the Netherlands entirely free of natural gas by 2050. Of course, the gas tap cannot simply be switched off tomorrow. Out of 8 million Dutch households, 7 million are currently connected to the gas network in Groningen – a figure which hints at the vast amount of work it will take to make the complete switch from natural gas to alternative sources of energy. Eric Wiebes, the Minister for Economic Affairs and Climate, though recognising the extent of the decision, has laid out a plan to ensure gas reduction through various measures. These steps include ensuring all newly constructed buildings are gas-free, a promise that was cemented by MPs who voted to prevent the choice for homes to have the option to use gas from 1 July this year. Wiebes has also promised to remove natural gas from the existing districts that currently rely on it. This will be done through a gradual transition of around 30,000 to 50,000 homes per year until 2022, from which date the process will be accelerated to 200,000 homes a year. The government currently has around €90 million available in subsidies to start make the first districts gasfree in 2018. Wiebes is also encouraging the purchase of small-scale sustainable installations via the Investment Subsidy for Renewable Energy (ISDE), a subsidy for the purchase of small, gas-free appliances. These include solar boilers, biomass boilers, and pellet stoves – which can be used to heat homes incredibly efficiently. This allows residents to produce their own sustainable energy in their home or business. He is also pushing for households to replace gas cookers and ovens with electrical alternatives, and to gradually phase out gas-fired heating installations. Of course, it is unlikely that in practice the process will be quite as simple as Wiebes has suggested with his gas-reducing measures. Commenting on the discussion about making homes gas-free in January of this year, the ING bank’s economic office weighed in on the other side of the debate. ING economist Gerben Hieminga pointed out that not all Dutch households are immediately eligible for gas-free alternatives. For a flat on the canals of Amsterdam, he suggested, alternative energy sources such as a heat pump simply will not work. He also warned that heat pumps and geothermal energy are now much more expensive than a central heating boiler, and that since the installation sector already has a staff shortage, it will be a huge effort to complete the job by 2050. 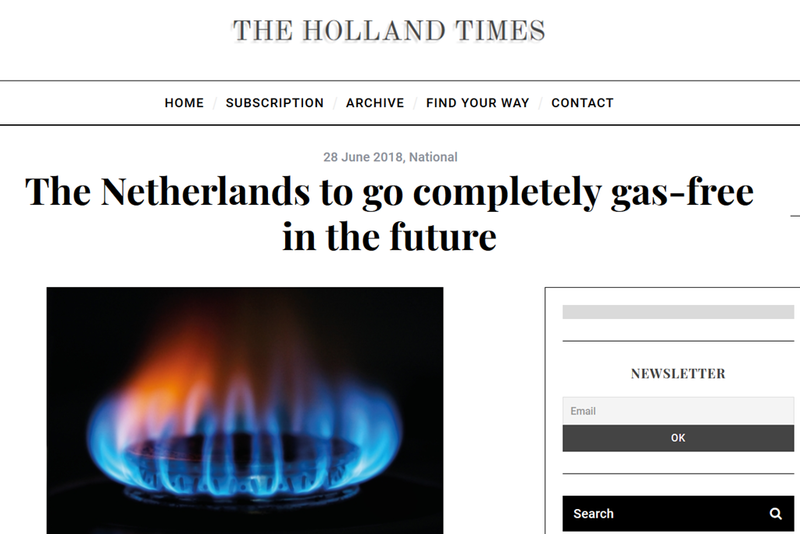 But whether this represents simple caution or active opposition to the plans, most sectors have come on board with the environmental plans to make the Netherlands entirely gas-free. “We want to accelerate by only developing gas-free homes,” Onno Dwars, commercial director at project development company Ballast Nedam Development has said. “According to the Paris Climate Agreement, the entire Dutch housing stock must be climate-neutral by 2050. Since the average lifespan of a gas grid is 40 years, building new homes with a gas connection amounts to destruction of capital. The new law strengthens our commitment to finally get rid of gas.’’ Milieudefensie, the Dutch branch of Friends of the Earth, has welcomed the commitment. It has been calling for a long time for gas production in Groningen to be halted and to discontinue the use of natural gas in homes. It is aware, however, of the challenges of going completely gas-free and has published a guide for the residential sector to help with the transition. In the first place it advocates for clear rules and objectives from the government. Knowing exactly how many cubic metres of gas must be saved per municipality is crucial to guarantee an effective response. Municipalities must also be given the space and financial means to realise these aims. The group is not only keeping pressure on the government, however. Milieudefensie says that municipalities must communicate and advise their residents from day one. It says that there are question marks regarding older buildings about who will pay for the transition and how it will be carried out; an effective dialogue must be set up to deal with this. ‘One size does not fit all’ has also become a crucial tagline for campaigners discussing the alternatives to gas. There are benefits to district heating networks in that they can be used on a larger scale, and do not require drastic adjustment to homes. But sufficient district heating is not available everywhere and more than half of the homes in the Netherlands will depend on a heat pump. Insulation of homes is a crucial first step to make the heat pump an effective option. Where good insulation is not realistic, for instance in older neighbourhoods, the focus should be on the use of geothermal energy. The Dutch decision, although clearly motivated by the Paris Agreement, is also linked to the rundown of the Groningen gas field. However, this is a bit of a red herring. As Timera Energy have recently reported, European and Asian spot gas prices have halved across the last six months as the current wave of new LNG supply (2016-21) is starting to outstrip demand growth. As is always the case with oil and gas, the markets run in cycles – low prices discourage new investment, thus leading to a tightening of the market, triggering higher prices and renewed investment. Nevertheless what is clear is that there will be abundant supplies of LNG on the world market for a long time to come, and at affordable prices. There seems to be a disconnect between the claims of their Greens and the real world. If the majority of the public are FOR stopping Gas usage why is the currently most popular party the ones against globalism and CAGW. Either they are lying or the Public are in for a very big shock when the implementation starts. The cost of this is going to be astranomical, their “The government currently has around €90 million available in subsidies to start make the first districts gasfree in 2018.” is a drop in the ocean as we are talking Billions of euros to implement and further billions in Electricity Investment and even more billions in increased fuel bills. Economic Suicide comes to mind. And CO2 AGW/CC suicide as well. If the UN, its IPCC and Governments around the world still believe CO2 is driving AGW & CC, then what does ripping out existing infrastructure, manufacturing new replacements, installing them and then sorting out the bugs in the installations create? You guessed right. More CO2. A lot more CO2. And a lot of unnecessary CO2 at that. There was a poll that showed that 70% of the Dutch thought the government announcement was just greenstanding in advance of the election. While it is true what the article says it is now very much in doubt that all of the goals and plans as defined by this cabinet will stay in place. There has been a lot of resistance and some parties were backing down for a couple of months already fearing the outcome of elections. This will however probably not be allowed by his own fractions in parliament and that of other coalition partners that lost heavily in this election ,mainly because of the climate idiocy. You recount excellent news from the Netherlands Johannes, Rutte needs a large boot applying to his backside and not only over these ‘end of gas’ loony ideas. I just wish that, some of this news is beginning to percolate, pierce minds as a drip, to spread into the house of Poison and Marxists./green wankerati sitting in our own UK parliament. Mass psychoses. If someone doesn’t stop this crap, WW2 is going to look like child’s play. You cannot deny reality without an uprising and massive death. Insanity only ends one way and it’s NOT pretty. Excellent post Sheri, the masses need to wake up to this Lemming like energy catastrophe that is being driven by the EU Eco lunatics. Spot on. There will come a point under their plans when life just becomes so miserable that what is there to lose by locking and loading and giving truth to von Klausewitz that war is the pursuit of politics by other means. Are the Dutch gas fields depleted and economically not viable ? I think this is an important part of the discussion to be had – anybody ? If it is simply a gesture to virtue signal then there will be (big) trouble…. At first It was mainly because of the induced seismicity in the area. Lots of minor quackes ,damage to properties and people asking to shut the operation down. They have since coupled this issue to the climate “problem” , natural gas is a bad thing because of CO2 etc. But how you can produce electricity with only sun , wind , no hydro, no nuclear , while also planning to shut down coal fired electricity plants I don’t know. The real “signal” is they are planning to go “gas free,” meaning that they also won’t be on the Russian pipelines, or the US LNG boat line. the only “alternative” energy acceptable to “greens” is electricity. When an entire nation is switched to electric heat in the winter, how sad if there is a grid failure during a cold snap! That is the intended result, not an accidental one, and it is all part of the reduction in the “useless eater” population of the human species that is desired by the elite. Eventually, Tom, that will either lead to war and violent revolution (as someone hints at above – when people get cold AND hungry they will also get angry) or anything burnable will be burned in open fires and coal will start to be dug out of the ground again. Holland is likely to be deforested. The Green Blob will not like that. Groningen gas has been a major funder of Dutch government spending for decades: it was the bounty that gave rise to “Dutch disease” where there was limited incentive to work when benefits provided 90% of the same income. Reserves were 2Tcm^3 in 1980, and 650Bcm^3 in 2017, with production already restricted as an anti-tremor measure to 36.6Bcm^3 – so in theory still 20 years’ supply or more if they continued to cut exports. Switching to imported energy is going to be economically tough, however they do it. They may not wish to rely on transit through Germany of Russian supplied gas, but spurning Norwegian supply into Emden, just across the border, or via Zeepipe to Belgium, has to be an interesting risk to run. Of course, Groningen gas is L-gas (low calorific value) with its own separate distribution network that extends into parts of Germany and Belgium, not H-gas (normal methane as from LNG), so replacing it is with imported methane is no simple task: the network would have to be switched progressively, and appliances would need new burners. A part of the Dutch network is on H-gas already, and fed from North Sea fields in the Dutch and British sectors, and some interconnection with the rest of the European network: this is the source for gas exported to the UK from Balgzand. IDAU Can’t they just mix the H-gas with nitrogen to the right consistency for L gas (or even mix in CO2 I suppose)? If so, that doesn’t seem a big deal, and my faulty memory told me that happens already. Any such process adds to the cost, I suppose, but it avoids changing everybody’s gas cooker. Hmm – this suggests the NL do do this? From curiosity and no particular knowledge on this subject – but that doesn’t stop folks! Even more curiously and OT – where does the nitrogen in L gas come from? There’s a short section on the field composition and how they speculate it arose. The Dutch always liked a windmill anyway, but will they like the intermittent wind? But at least their intelligent forefathers realised that steam, diesel and electricity were more reliable. Quite. When the Haarlemmermeer was drained in 1849, what did they use? They reckoned 166 windmills might do the job, but they built one De Cruquius steam pumping station instead. This should ensure the new Dutch party which does not believe in climate change and has just taken a large amount of seats in Dutch politics, take full control from the idiots currently running that country. What complicates matters is that there are two separate gas markets/grids in Holland. The gas from the Groningen field is ‘L-gas’ i.e. low calorific value (heat content); other parts of Holland, the UK, Germany, Norwegian gas, Russian gas is ‘H-gas’ i.e. high(er) heat content/calorific value. The enviros are attempting to ride on the issues with Groningen/L-gas production reductions & extrapolate them to the rest of Holland. Seems that democracy has morphed into hystericocracy. It is a shame that the anti-fracking brigade will jump straight on this bandwagon. I understand that the Dutch have been extracting gas since the ’50s and it is not extracted through hydraulic fracturing. The earthquakes (and if you read independent reports, subsidence) result from subterranean collapse due to reduced pressure of the gas bearing strata and is entirely predictable. Living in Cheshire, as I do, we witness subsidence and damage caused by brine extraction over several centuries, with houses in the past sinking by many feet overnight. As a consequence new buildings in the affected areas are built on rigid rafts and many buildings have a Tudor-style timber frame to make them more resilient to earth movement. In addition the Brine Compensation Board was set up in 1952 by act of Parliament to provide redress to affected property owners. I don’t recall any mass protests by green demonstrators in Chesire in the nearly 40 years I have been here. And I suspect that they would have been given a hard time by local workers whose jobs in the chemical industry rely on brine as the starting point for much chemical manufacture. Cheshire salt caverns are of course used for storing natural gas: they recently did a major expansion at one of them. There is a suggestion that caverns might be used for CO2 storage too. Can’t imagine that would be too popular with Cheshire residents, with a Lake Nyos tragedy in mind rather than seismicity. If there are problems with the domestic supply of natural gas in Netherlands and UK, why not plan to import LNG. There are many countries with abundant LNG exporting all over the world, USA, Australia, Qatar etc. Would be much less expensive and disruptive. If this is all being driven by the Paris agreement, wouldn’t it be more logical to be very sure that the climate really is warming, since there is a great deal of doubt about that. And if it is really warming, is it definitely carbon dioxide that is the cause. I doubt very much that it is. Surely these two things need to be absolutely conclusively established before taking draconian decisions like ending the use of gas to heat homes. As stated above, the gas from the Groningen field is ‘L-gas’ i.e. low calorific value (heat content); LNG is ‘H-gas’ i.e. high(er) heat content/calorific value. It’ll take a lot of money to convert L-gas networks, equipment and appliances to be able to use H-gas. But it’ll be a lot less money than to try to provide substitutes. Dutch users of L-gas will squeal! Netherlands have only had 1 earthquake in the past year over 1.5 magnitude and a 3.5 near Gronnigen 7 years ago. None enough to cause damage. It took me 5 mins to look up Earthquakes in Netherlands. Why do these people lie all the time? Incidently, Dorking had a 3.3 on the 23rd Feb 2019, didn’t here too much about that. Yes, the article is written in an emotive and biased manner by an obvious green zombie. Be interesting to see what a rational writer makes of this plan to cripple the Netherlands. The Dorking quake was the talk of my Friday beer drinking session in Godstone. My pals had all experienced it but I didn’t – maybe I just sleep heavier. Truth, facts, reality, they simply no longer matter. We live now in a political world that has become enthralled to tiny numbers of activists pushing extremist agendas with the flimsiest of evidence. The Dutch are moving forward with this insanity, London with the stupidity of air pollution limits that have no basis in science, let alone recent history, the salt Nazis have taken away an essential mineral from our food and women are being arrested for using the wrong pronouns. It is like there is a mass psychosis in our elites. It does look as though there have been few tremors in recent months. One of ML 3.4 in January 2018, two of ML 2.0-2.5 in February and one of ML 2.5-3.0 in April. Anything below ML 2.0 is not usually felt. Even the ML 1.5-2.0 numbers are in decline, with about two every three months in the second half of the year. The limit for fracking operations in several US states is ML 4.0. I recently had a ML 2.0-2.5 tremor barely a mile away. I did not feel it at all. This article gets to the nub of the matter. So we don’t have a monopoly on retarded politicians, obviously. My great aunt – in another age and place – had a gas well on her farm. She even had little gas lights on the walls, but not electricity. In the nearby town, we had gas heaters and cooking, and electric lights and household equipment. Since 1967, I have not had gas available to choose from. Last move was in 1989, to an all electric house. Neighbors also are 100 % electric, but a few have big propane tanks. Our heater is an “air-sourced” heat pump that is also an air conditioner. Key aspect: electricity is low cost and reliable (Hydro). What do you suppose will happen the the value of the first houses to be taken off-grid? people don’t mind much what a government does, apathy abounds, but devalue an individuals asstets and I think you will see a different attitude. It is asinine. Quite apart from anything else, I find it impossible to take all this seriously while motorists are driving around in cars that are double the size they were 50 years ago. Yup – I can barely see my little hatchback between all the giant Range Rovers, Kia Sportages, Ford Kugas and BMW X5s in the shopping centre car park. The public are clearly not very concerned about maximising their MPG or minimising their environmental footprint. And this trend to big cars has happened despite government climate propaganda being at fever pitch. Cars are much larger but much more efficient. In the early 1980s I had a 3.5 litre V8 Rover that went rather well but did about 20 miles to the gallon. My current Ssangyong Korando can match the old Rover for performance, has the carrying capacity of a small truck and does over 40 miles to the gallon. Yes, but what about all the energy that goes into the manufacture of these enormous cars? And materials? It’s a joke. We in Europe do not produce greenhouse gases enough to make any difference to the climate, even if the computerised models’ speculations have any basis in fact. When Netherlands become a caliphate, that decision will be reversed. Ok – this is an early April fool prank – right? After all the nederlanders are a sensible race, not silly like us who obey the insane global warming nonsense. Which comes from the same people who will be suffering from higher energy costs as a result of the policies their funding will produce. Double jeopardy in action…. They’d better accelerate their nuclear program first.